Through close links with local schools and St George’s Bristol, Churchill Music has developed an extensive and varied programme of youth and community work, supported by generous donations from our Champions and sponsorship from the Cavatina Chamber Music Trust to which Churchill Music is proud to be affiliated. Please browse this page to find out what we’ve been doing in Churchill Academy, Local Primary Schools, and in the community. Each year, Churchill Music launches its new season with a concert especially arranged to include either the work to be studied by the A-level students or an aspect of music chosen by the Churchill Academy’s Director of Music which will enhance the music GCSE and A-level courses. We have a Student Pass scheme which is currently open to all music students at Churchill Academy. Students sign up and pay just £12.00. This gives them free access to all classical and jazz concerts. Churchill Music sponsors internationally renowned musicians to lead workshops in the schools. Workshop leaders the Barbirolli Quartet with clarinettist Timothy Orpen, Majestic Brass, Metropolitan Brass, the Carducci String Quartet (winners of no fewer than seven international chamber music competitions, The Aquinas Piano trio, London Bridge Piano Trio, Nicholas McCarthy, to name but a few. Open to music students of all genres at the Academy, Churchill Music created this competition in 2007 to encourage and reward not only technical excellence but also performance skills and presentation. Three awards are made, generously supported by an anonymous donor: Churchill Young Musician of the Year, Churchill Music Junior Trophy, and Churchill Music Audience Trophy. The Churchill Young Musician of the Year and the Junior Trophy are awarded by our judging panel, which includes a professional performing musician with representatives from Churchill Music. Our audience vote for the student whom they feel deserve the specially commissioned Audience Trophy. 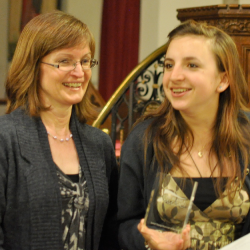 Pictured is Catherine Freda, Head of Education, St George’s Bristol with 2012 Churchill Young Musician of the Year, Therese Paine. The 2013 competition takes place on Monday 28 January at 6pm in St John the Baptist Church, Churchill. Each year, groups of students from Churchill Academy, Merchant’s Academy, Bristol and Worle School work individually and together with the Asana String Quartet (all members of the Bournemouth Symphony Orchestra) and composer Jeff Spencer to compose works based on a dance theme. Their final compositions are performed at a special Showcase event by the Asana Quartet which regularly brings tears to the eyes as the students realise the incredibly high standard of their compositions. The project is facilitated and sponsored by Churchill Music. Pictured: Merchants and Churchill Academy students with the Asana String Quartet. 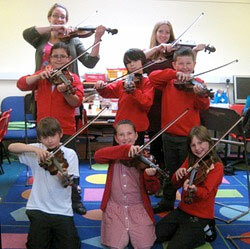 Having identified an urgent need for greater string provision at Churchill Primary School, Churchill Music approached local businesses, Churchill Parish Council and private donors to help purchase 10 quarter-size violins for the school. Started under the expert guidance of our former Patron, Vivienne Price, MBE, founder of the National Children’s Orchestra, and continued with Liz Whittam, performing violinist, we are proud to be providing an opportunity for every Year 2 pupil at Churchill Primary School to try learning the violin. 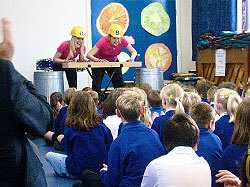 Such is the success of this project that in 2011, a further project was started in Sandford Primary School. Thanks to the generosity of an anonymous donor, a further violin project took place after school at St Martin’s Junior school in Worle. 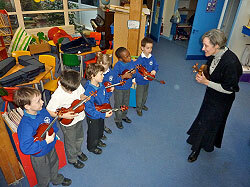 The children were delighted and called it their “Violin Academy”. Churchill Music organises, facilitates and sponsors or part-sponsors internationally renowned musicians to lead workshops in the school. Workshops have been given by the Pavao Quartet, the Thorneloe Trio, violist Richard Crabtree, the Drum Blondes, the Eden:Stell guitar duo, Majestic Brass (who combined music with numeracy), the New London Chamber Ensemble wind quintet, John Dalton, harpist, the Barbirolli Quartet, the Carducci String Quartet and the Aquinas Piano Trio to name but a few. As well as supporting projects in Churchill Academy and local Primary Schools, Churchill Music commissioned The Same Flame, a set of five songs for choirs of all ages and abilities, to encourage communities to come together through music. In 2012, Inspired by Baron de Coubertin’s ideals of Olympism which gave rise to the modern Olympic and Paralympic values (Courage, Determination, Excellence, Inspiration, Respect, Friendship and Equality) Composer, Thomas Hewitt Jones and poet, Matt Harvey created an uplifting and inspirational song cycle – ‘a manifesto for life’ which undoubtedly will stand the test of time. 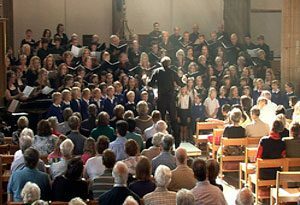 Choral director, David Ogden was more than equal to the challenge of leading no fewer than six choirs: the Exultate Singers, the Trinity Singers, Churchill Academy Chamber Choir and the choirs of Churchill, Sandford and Wrington Primary Schools. The commission was assisted by a grant from The National Lottery through the Arts Council England. 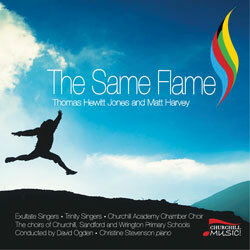 Such is the quality of ‘The Same Flame’ that Boosey and Hawkes have published the work, with the individual movements available on sale, and the choirs have recorded it. The sustained standing ovation at the World Premiere on 8 July 8 2012 was testament to The Same Flame’s great significance and appeal. The fourth song, All Weather Friends, was specially written for primary school children. Thomas’ catchy tune with Matt’s fun yet poignant message about the value of friendship in life is packed full of metaphors and teaches the word ‘friend’ in no fewer than eleven different languages. Available as an individual song, this surely is a ‘must’ for all primary school-aged children throughout the world. We are confident that future singers and listeners alike will experience not only the joy of The Same Flame, but also its embodiment of those values, through witnessing communities coming together to SING! Churchill Music is extremely grateful to: pianist, Christine Stevenson, the individual choir directors and primary school teachers, to David Ogden for his inspirational guidance, and above all to Thomas and Matt. Choral Director, David Ogden describing the work, “…fantastic words by Matt Harvey which Thomas Hewitt Jones has set in a very entertaining, vibrant and very energetic way and I hope that this piece will be taken up by lots of choirs around the country and around the world – it has lots of vitality and energy. CDs can be ordered using the order form. Churchill Music sponsors a special, interactive and lively schools concert. Year 6 pupils from feeder primary schools travel to Churchill Academy to hear top-quality live music performed by professional musicians. Pupils are not only inspired by the music, but will also gain a feeling for the strong musical ethos of the next step in their education. Feedback from pupils, teachers and parents strongly indicated that this age group enthusiastically responds to classical chamber music. Copyright © 2019 Churchill Music. Powered by WordPress. Theme: Spacious by ThemeGrill.